I live at the bottom of an ancient dried river bed in Penfield NY. An early version of the Genesee River flowed through here, but the last ice age moved it west. 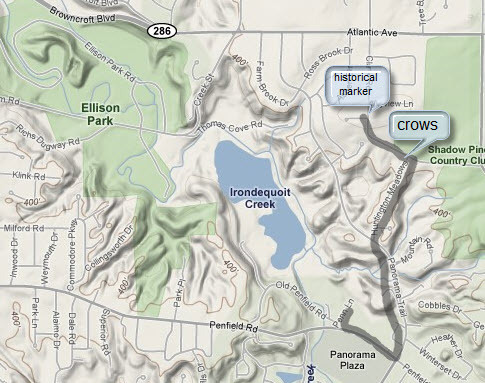 All that remains is the flooded mouth (Irondequoit Bay), a small lake up at the dolomite quarry, Irondequoit Creek, and the corrugated valley. A walk in any direction is uphill. My most energetic walk ends at the historical marker on Clark Rd, at the high point of Denonville Ridge (see path on map above). 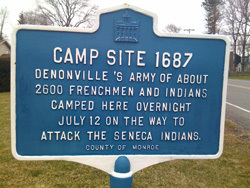 The marker reminds me that our quiet region was the site of nasty wars between the indigenous locals (also fighting among themselves) and French soldiers invading from Canada across Lake Ontario. Jesuits were in the mix, converting some Indians, being martyred by others. There are more scenic routes to walk, but I go because of the crows. They cluster by the hundreds on the ridge and in the ravines behind the homes around the intersection of Huntington Meadows and Clark Roads. Yesterday the sky was low and gray. The crows were raucous. In the distance... a plane... a train... and sirens. The world felt ominous. I was alone with the woeful crows while the world was racing to solve its problems. Tech Note: Soundscape recorded on iPhone with iTalk, edited with Sony Soundforge. Photo by iPhone, emailed to myself. Map by Google, edited in Techsmith's Snag-It.